The top mobile query accounted for about 0.8 percent of all wireless queries, and the top 1,000 mobile queries accounted for about 17 percent of all cell-phone-based queries. After issuing a query, the user receives 10 search results. Most users either found what they were looking for on the first page of results or chose not to look further; only 10.4 percent of queries had requests to display more than the initial set of search results. or refined the search in a subsequent query. 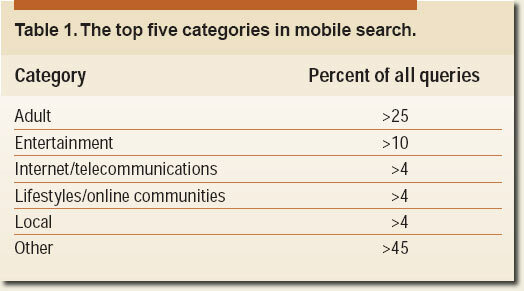 And what do you think people might be searching for on their mobile phones? The paper is written by Maryam Kamvar and Shumeet Baluja, both Google engineers, and took a sample of data from a large US carrier over a 1 month period. The full text can be downloaded here. Never mind Blackberry – it’s fairly difficult to use on a PC. I travelled to both Belfast and Cork in the past 3 months, both via Irish Rail. But I can safely say whoever designed the schedule checking and purchase funnel should hang their heads in shame. On a brighter note, didn’t the Dart do some interesting stuff with timetables via SMS? Your chat in the forums gave me the idea for this post. Absolutely – roll on the hard times and SEO will likely really take off.